Do you love easy crochet patterns that you can whip up in an afternoon? Then you're going to love these Crocheted Hats to Donate. 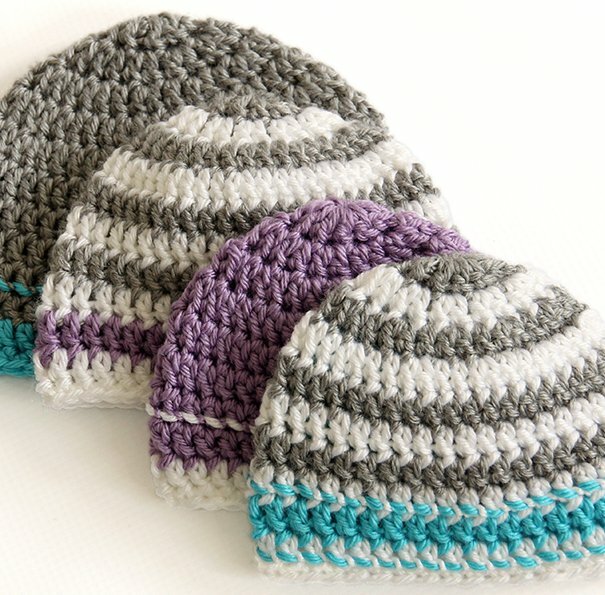 Easy enough for beginners, these simple crochet hat patterns work up quickly and effortlessly and make wonderful gifts to donate to your local shelter or hospital. Available in a variety of sizes, this simple crochet hat pattern is a wonderful one to add to your collection of must-have project tutorials. Ch 3 and then make 11 double crochets into the ring. Join with sl st.
Ch 3 and then 2 dc into the same stitch. Now do 2 dc in each stitch around and then sl st to join. Ch 3, 2 dc in the first stitch then 1 dc in the next and the repeat this pattern for the entire row. Sl st to join. I love that these hats are fast and easy. Since many of my family members, including my oldest son, los their hair during chemo. I want to make some and donate them to the cancer patients where my son took chemo. I know the patients would love these cute hats to wear. These hats are incredibly easy and quick to make. I have made one of these hats in as little as 15 minutes. They are easy to adjust. They are plain, so you can embellish them any way you like. If you need something quick and versatile that you can make in a hurry for gifts or a bazaar, this is it!